Its design uses the latest Toyota trend with an aggressive mix of sharp lines and bulges that form a shape that appear solid and in the same time has tension and fluidity. 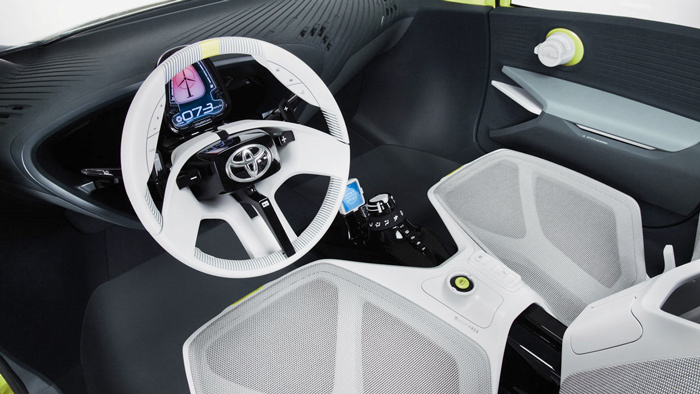 The best examples of this design trend are the Toyota iQ and Lexus LF-A. The first is a very powerful and aggressive looking car despite its awkward proportions and small size and the second is a very original looking supercar that is very modern (maybe too modern) and aggressive in a discrete way, dissimilar to its competition. The interior uses very few components without looking cheap or empty. It shares the same values with the similar concept of Citroen, the C-cactus. This minimalistic design help the weight kept low, it is very space efficient and also gives an air of roominess. It could easily reach production if the public won't be too conservative and companies that have already show such concepts accept the challenge.